FORE School of Management organised book release event on "Malaysia: Challenges and Perspectives"
FORE School of Management has organized a book release event for its first ever special book on “Malaysia: Challenges and Perspectives” published by Bloomsberry containing 20 no of articles having 358 pages on August 14, 2014 at its campus. More than 80 participants from corporate have attended this event. 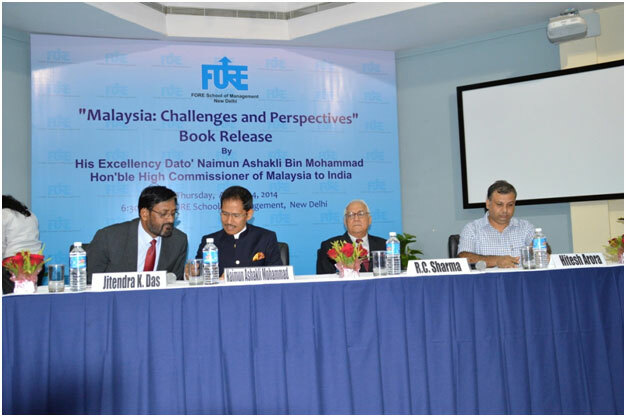 The book was inaugurated by His Excellency Dato’ Naimun Ashakli Bin Mohammad, Hon’ble High Commissioner of Malaysia to India. 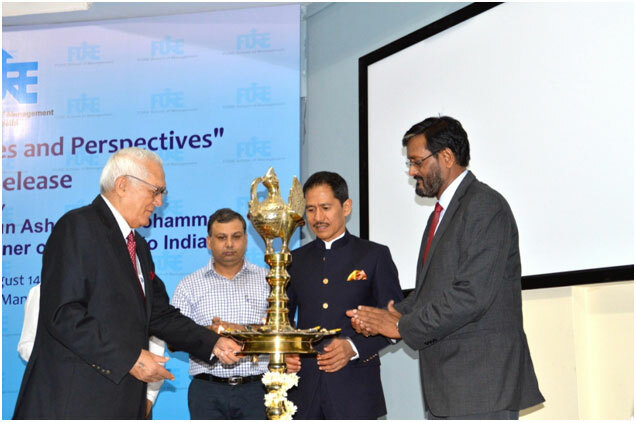 Mr. R. C. Sharma, President-FORE, Dr. Jitendra K. Das, Director- FORE and Dr. Hitesh Arora, Chairman (Publication, Research and Seminars)-FORE shared the dais with the chief guest. The articles in the book are written by FORE-Faculty members who had an enriching experience at Malaysia during their International tour for the Faculty Development Programme (FDP) in October 2012. In this book, FORE faculty members have contributed to the various aspects of Managerial Lessons for India and Malaysia. Mr. R.C. Sharma, President- FORE appreciated the effort of FORE faculty members in writing various articles on Financial Services, Trade and Infrastructure, Public Utility Services, Women and Cultural Dimensions, Governance and Corporate Social Responsibility. He also emphasized on the rich heritage of Malaysian History and encouraged faculty members to write about it. This led an important foundation of FORE faculty members to come up many more books on the experience of their International FDPs which is organized in different parts of the world. The Director-FORE, Dr. Jitendra K. Das, welcomed the Chief Guest and presented a brief of all the articles written in the book. He briefly talked on “How Malaysia has become one of the most prosperous Southeast Asian economies surpassing the income per capita of countries like Indonesia and Philippines and India should try to emulate Malaysia’s success story stemming from outward-orientation, high standards of education and high savings rate”. 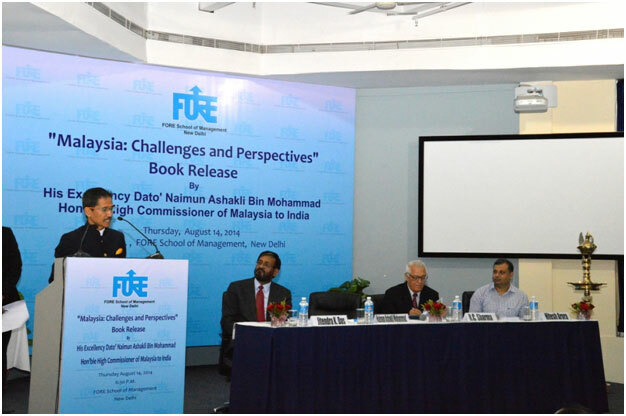 His Excellency High Commissioner of Malaysia to India - Dato’ Naimun Ashakli Bin Mohammad was delighted to release the book and deeply valued the contribution made by FORE Faculty members. He talked highly of the relationship between India and Malaysia and how they can leverage on it through different trade and mutual understandings. He further encouraged the FORE faculty to come up with more books on Malaysia. At the end of the event, Dr. Hitesh Arora, Chairman - Publication, Research and Seminars, FORE School of Management proposed a vote of thank speech.